Most people invite puppies on the furniture only to regret it later. If you have a puppy and you don’t want him to jump on your furniture indefinitely, do yourself a favor and discourage the behavior from the start. Young puppies should be level trained because their seeing you above them, whether on a couch or bed, communicates your authority passively. As your puppy matures, you can permission train him. Place your puppy on a leash and walk up to your couch or bed. Encourage him to go to his own bed and, when he does, pet him. Walk back and forth until he goes to his own area automatically. Lead your puppy to the couch or bed and sit down. If he’s about to jump up to join you, tug sideways and ignore him until he sits quietly on the floor. Direct him to his own bed and reward his cooperation with a chew toy. You can teach your older puppy to come up on your couch or bed only when given permission. Sound confusing? It really isn’t. Your puppy can learn anything if your rules are consistent. Wait until your puppy is at least 6 months old to introduce the concept of permission. Until this point, you should level train to ensure that he respects your authority and doesn’t see you as a puppy. This step is important if you want to earn your puppy’s respect and focus. For this step, follow the steps outlined in the preceding level training section. 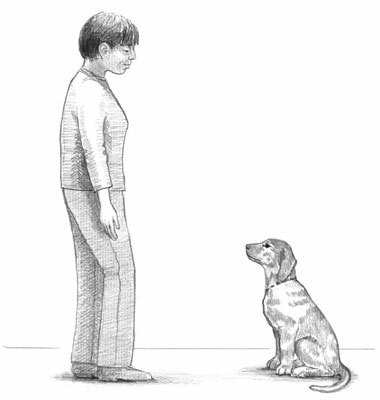 Sitting and looking to you is how your puppy should learn to ask permission to join you. Your puppy should ask permission by sitting and looking to you. He’ll freeze and look confused. Guide him up gently and pet him lovingly. If your puppy gets hyper on the furniture, he’s too young to contain the excitement of being on your level. Wait a couple months before reintroducing permission training.